The Farnham Chapel at St Bartholomew’s, Quorn, is one of the few remaining private chapels within a parish church. It belongs to the Farnham Trust and can only be opened with permission of the trustees. The Chapel was added to an existing Norman church in 1392 by John de Farnham. There are no extant medieval monuments. According to a church guide a relief showing a battle scene is of Robert de Farnham (d.1349) at the Battle of Crecy/Siege of Calais in 1346; it is certainly not of this date and will be dealt with in more detail below. 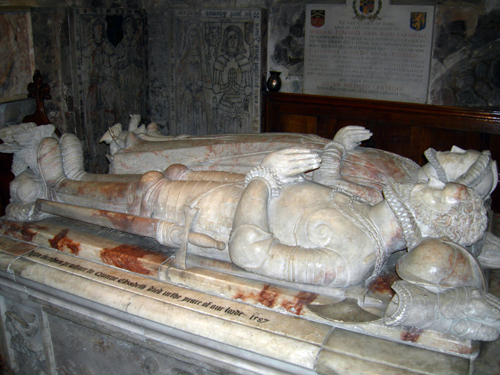 Today, the south chapel is crammed full of monuments to the Farnhams dating from 1502 onwards and it is the splendid chest tomb with recumbent effigies of John Farnham (d.1587) and his wife Dorothy Walwyn (fig.1) that dominates the chapel. Even a Bacon (c.1775) flanked by two neo-gothic monuments (c.1850) are in its shadow. However, the chest tomb was never intended to be placed in this chapel, and none of the existing seven early-modern alabaster monuments are in their original location. The 1887 re-ordering of St Bartholomew’s which made the church more serviceable to the living had a dramatic and damaging effect on the Farnham monuments. 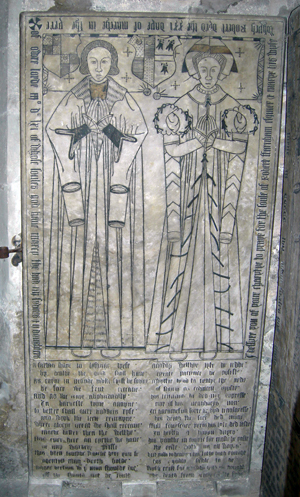 During the sixteenth century, the Farnhams engaged in what can only be described as a flurry of memorialising in three generations. 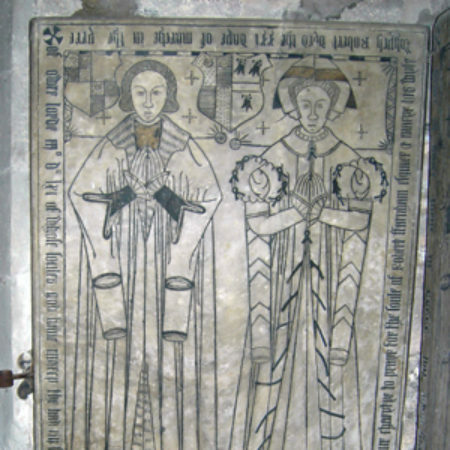 They commissioned nine monuments – including two for second sons – seven of which are at Quorn. 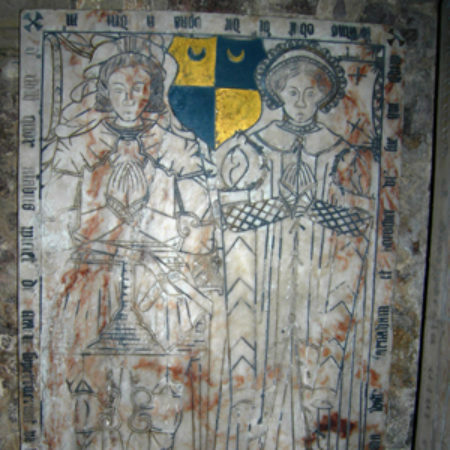 John and Dorothy’s is the last in the series and it is this monument and how it related to the other early-modern alabaster memorials that I shall concentrate on. Not only is this an impressive alabaster monument, but it is also an interesting example of how complex and problematic the study of a monument can be. For nothing is quiet as it seems. Sherlock reminds us that ‘monuments were not commonplace objects automatically erected by gentry and nobility to convey formulaic messages’ and that at most, only a third of these families erected any sort of memorial. So it is worth exploring why a family should suddenly engage in this activity. 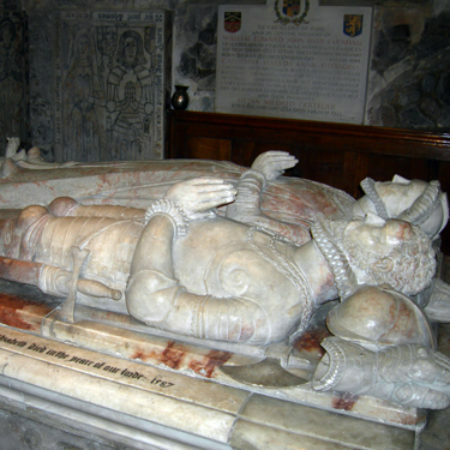 Shortly after the death of both the John de Farnham who commissioned the chantry chapel and his eldest son John Farnham in 1416 (there is a serious shortage of Christian names in this family), their respective wives seemed to have fallen out and the family split. The senior side of the family remained in Over Hall, whilst the younger son Thomas built Nether Hall. In St Bartholomew’s this necessitated two separate chapels. The Over Hall family used what is now the Farnham Chapel in the south aisle and the junior Nether Hall family used a chapel in the north aisle. 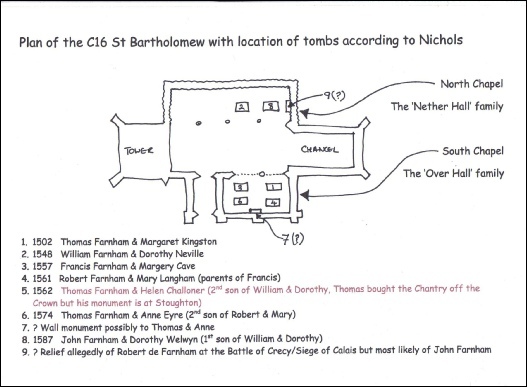 Referring to Nichols, who recorded the monuments in the mid-eighteenth century prior to their reorganisation and restoration, it is possible to reconstruct where the tombs were originally sited. Using the dates on the monuments we may also speculate on the order in which they appeared. 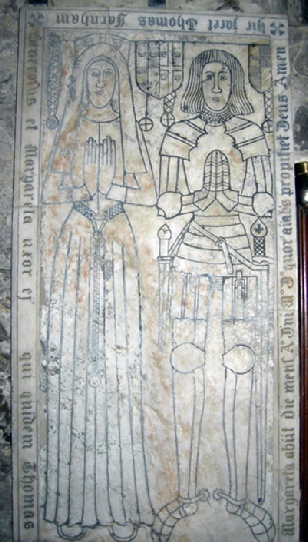 Fig 2: Thomas & Margaret Farnham The first monument is an incised slab which was on a chest to Thomas Farnham (d.1502) and his wife Margaret Kingston (fig.2). 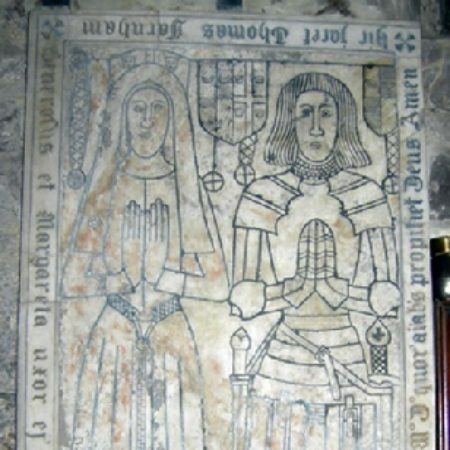 We don’t know why Thomas and Margaret decided to commission this monument, but it is worth noting that Margaret’s family had commissioned at least five monuments between 1480 – 1516, all of which had been placed at Rothley (sadly four have been lost). The remaining one shares similarities with Thomas & Margaret’s, especially the uncomfortable position of the hands and may have come from the same local workshop. There followed at least three commissions from the Royley workshop at Burton upon Trent (2, 3 & 4 on the plan). All are incised slabs and were according to Nichols mounted on chests tombs. Today they are propped up ignominiously in the corner with that of Thomas & Margaret. Although this makes them much easier to read they have sadly lost their authority. Badham describes how such monuments would have been polychromed, gilded and decorated. The chests would have borne heraldic devices and probably weepers/children, much like those still present at Peatling Magna, and would have affected a much greater presence. The style of the three Royleys draws directly from the first Farnham monument. 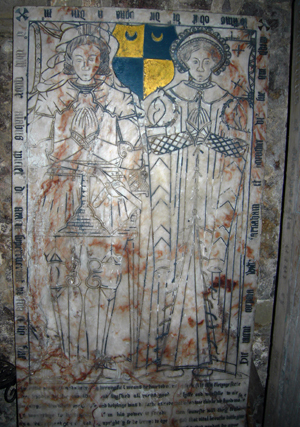 The four together create a strong sense of continuity, even though one of them would have been originally placed across the way in the North chapel. Margery’s dress is an exact copy of Dorothy’s, and Francis and Robert (father and son both lawyers) also wear the same long gowns. The inventory of Francis’ household possessions when he died and their value still exists. The list consists of what would seem to us today to be mundane objects, such as towels and kettles. Richardson reminds that this was ‘a period in which there were still comparatively few objects of any kind in circulation’, so a monument was a very important display of wealth. The sum total of Francis’ household possessions was £29. 13s. 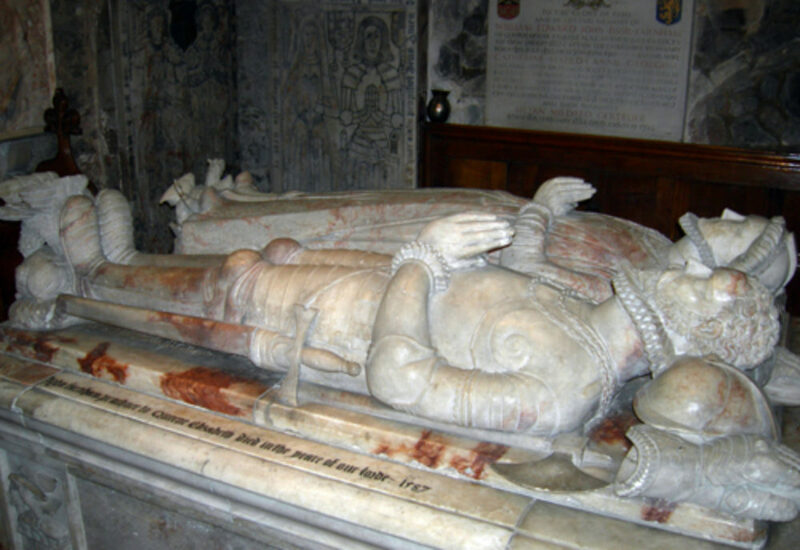 As Greenhill laments we don’t know how much a Royley incised slab on a chest cost However, we do know that the Shirley monument (c.1585) with recumbent figures at Breedon on the Hill cost £22. This gives us an indicator of the expense involved. agodly welthye lyfe he ledde. his tenants he ded not oppresse. nor of his neghborys non. In haramefull sorte he dyd transgresse. It is important to these three Farnhams that they are seen to be modest, upright and fair and their monuments bear witness to this. The Royley slabs stress continuity; on their original chests they would have had more presence, but would not have been excessively showy. Although these memorials straddle the Reformation the marginal inscriptions all show a concern about the transit of their souls through purgatory. The fifth monument commissioned for a Farnham during this period is not at Quorn but at Stoughton and is from Richard Parker’s workshop. 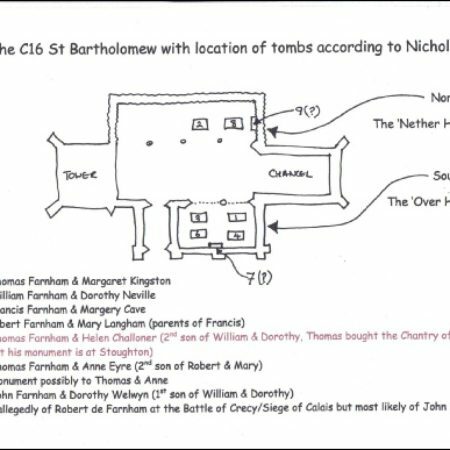 Although Thomas was a second son, he was important to the Farnham family. As Chancellor of the Exchequer under Edward VI and Mary, he was instrumental in securing the Farnham Chapel by buying it from the crown in 1553. So it is interesting that he is not at Quorn, but therein lies another story. He was the younger brother of John and we shall come back to their relationship later. The seventh, recorded by Nichols, was according to Greenhill broken and disappeared in 1887. An eighth attributed to Richard Parker is at Stoughton, Leicestershire.